Police chases have been made strangely popular by reality T.V. shows that depict cops chasing down criminals. 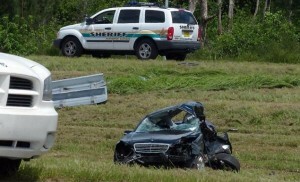 A crash that occurred on Wednesday morning served as a reminder of just how deadly those high-speed chases can be. NBC News reported that the chase began after police discovered that a South Miami Heights woman and her daughter had been shot and killed. When the police tracked down the woman’s ex-boyfriend, he fled, leading police on a chase through multiple counties. He began to speed excessively and started weaving in and out of traffic before eventually colliding with another car. The driver of the car, Maritza Medina, was ejected by the impact. Police officers rushed in to drag Medina to safety but found that she had already died from her injuries. Both vehicles were extremely damaged by the crash. SWAT teams surrounded the shooter’s vehicle, which led to a standoff that ended when police officers heard shots from within the vehicle and approached, finding the shooter had died from self-inflicted gun shot wounds. Since the crash on Wednesday, police have launched an investigation into the shooting. Preliminary reports suggest that the shooting was related to a domestic issue, perhaps a break up. More recent reports revealed that the shooter was engaged in various illegal activities, including growing and selling marijuana. Many of the police officers divulged that the woman driver’s death affected them personally. They were shocked by innocent, which took the life of an innocent woman who was at the wrong place at the wrong time. It is certainly sad to imagine the pain that Maritza’s loved ones are going through now. The sad truth is that there are about 12 million automobile accidents every year. Many result in death, and many are caused by the negligence of another driver. When a person dies as a result of another driver’s carelessness, it is particularly devastating for the victim’s loved ones, who are left to pick up the pieces of that person’s life. Wrongful deaths can also place a heavy financial burden on the families of the deceased, who must make funeral arrangements, repair the broken vehicle and may be left without a primary caregiver. Between the financial and emotional devastations, the victims of these crimes will need help recovering damages that will help offset the costs. At Wolfson Law Firm, we have a great deal of experience representing the families of people who have been killed. Let one of our personal injury attorneys help you get the compensation you deserve. Contact us at 305-285-1115.